Visit our membership page to find out how you can join. The Building Safety Group held its fourth annual Health & Safety Awards ceremony on Wednesday November 7th 10:45am – 2:30pm at the Williams F1 Conference Centre in Grove, Oxfordshire OX12 0DQ. The commemoration is held to mark our members’ achievements and excellence in work-related health and safety performance. The day also included keynote speeches from two high profile industry speakers: Steve Hull, who is a Principal Inspector for the Health and Safety Executive (HSE) and Richard Voke, who is a Partner at Ashfords. Steve discussed recent HSE prosecution cases as well the common health and safety issues encountered during site inspections. Richard presented some of his firsthand experiences when defending construction companies in their dealings with regulatory bodies and government agencies. Thank-you to all our members who attended BSG’s Awards ceremony, held at the Williams F1 Conference Centre, in Grove Oxfordshire. We hope that everybody enjoyed the day! The Williams Conference Centre is an experience that never fails to impress, located at the home of the Williams F1 Team in Grove, Oxfordshire. Originally the base of BMW’s Le Mans project, the building was converted in 2002 and today stands as an award-winning conferen ce centre, offering a modern and creative environment in which to meet, train, network and entertain- so a perfect location for the BSG Awards ceremony! 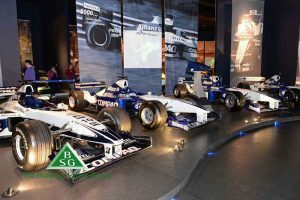 BSG Members who attended the awards were given the opportunity to take a private tour of Sir Frank Williams’ exclusive Williams Grand Prix Collection. Housing more than 40 of the team’s seminal race cars, it is the largest private collection of Formula 1 cars in the world, charting the team’s 38 years of F1 history. The Building Safety Group is not responsible for the content of external sites.